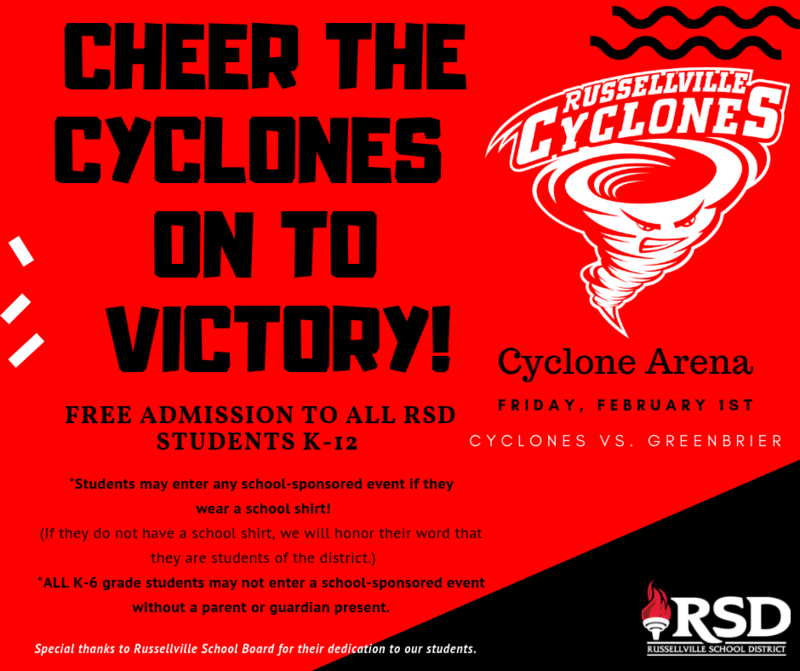 The Russellville School Board has announced that students K-12 will be able to enter all school-sponsored events at no cost beginning February 2019! Students will be allowed to enter, at no cost, to any school-sponsored event if they wear a school shirt to verify that they are a student of the district. (If they do not have a school shirt, we will honor their word that they are our student at this time.) All K-6 students may not enter a school-sponsored event without a parent or guardian. The RSD School Board made the decision in hopes of encouraging more students and their families participation in after school activities. Superintendent Gotcher has said in support of the board's decision, "no school district has provided such an opportunity for their kids and we are proud that we live in a district that can provide this opportunity. We are truly a district of choice!"